The school colors for UMBC are variations of those found in the state flag with an emphasis on Black and Gold. 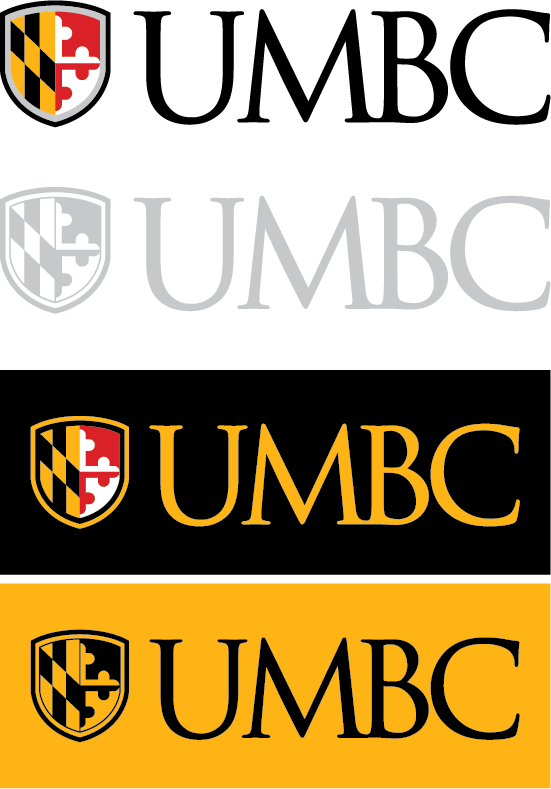 To build distinction within the university system, UMBC has selected particularly rich shades of gold and red, (PMS 1235 and PMS 1795 respectively), for its logo and stationery system. UMBC’s primary colors—black and gold—should be featured prominently on all other communication pieces and signage, with the secondary colors listed above used only as accent colors. Materials developed for undergraduate recruitment use are strongly encouraged to use black and gold. Whenever possible, designers should reproduce the UMBC logo in full color, since such a treatment reinforces the strength of the identity. If they are working with a limited color palette, the logo should be reproduced in a single color (and that single color can vary from the school colors listed above). Designers should not reproduce the color logo in any shades other than the official colors shown here, since this may create confusion as to the institution’s colors. In the above example, the black and gold box represents a field of color. The UMBC logo should never be colorized using unofficial colors. In a print environment, UMBC’s logo utilizes CMYK (cyan, magenta, yellow, and black) process. If your budget doesn’t allow for that level of reproduction, there is a single color option available on the downloads page. That version can be colorized in a single color and used on a color background (as seen in the example above). If you have any questions about color and/or color application for the UMBC logo, please contact Jim Lord, Director of Creative Services.